The ecology of water, its flora, fauna and microbes, past and present; water and geology, how they are related to the shape of the land; the history of humans and these waters; the development of the city, industrialization; infrastructure and the control, delivery and removal of water; neighborhoods and their local relationship to water; the way artists note the significance of water in a constellation of large and small projects throughout the city. Virtually every aspect of our lives is touched by water. Our bodies are around 65 per cent water, the food we eat, the clothes we wear, the buildings we occupy, the city we live in, the industries that supply the goods we consume are all dependent on water. What if it was possible to have a more intimate understanding of this intricately woven web and create a ‘ripple effect ‘of involvement with water throughout the city? 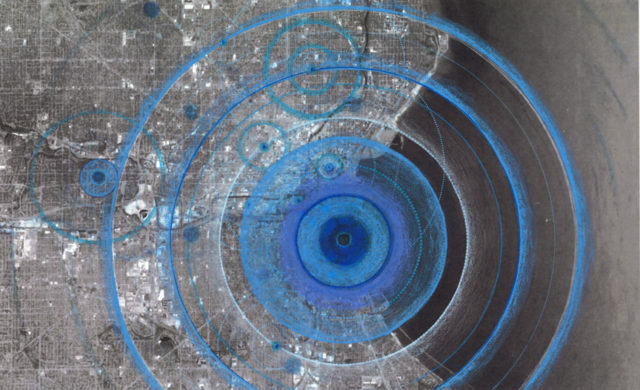 This project proposes to transform the city of Milwaukee into an Atlas of Water, where a point by point mapping of the topic occurs at the scale of the city. 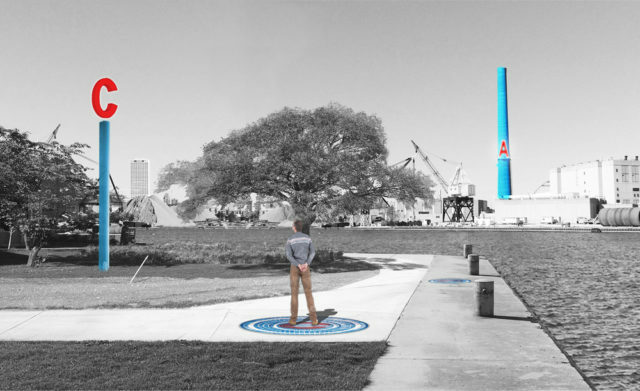 Specific locations will be identified by a series of vertical markers that range in scale from a 300’ repurposed stack to a newly installed marker or a repurposed utility pole. Each of these will act like an oversized ‘map pin’ and will indicate a piece of the water story particular to the site. For instance the stack for the city’s water treatment plant can reflect data for projected precipitation. It becomes a very visible barometer which residents can check, enabling them to become living parts of the city’s green infrastructure as they learn to be more mindful and take control of their water use. An adjacent ‘ripple marker’ will note web access or audio dial up information where the viewer or listener will be made aware of other parts of the city’s complex water story. Starting in the Inner Harbor a constellation of markers can be installed throughout the city making the ripple effect increasingly tangible. Each of these sites is a potential starting point for a collaborative team of an artist and a scientist / historian / expert to conceive projects that will make the various complex topics of water visceral and tangible in the immediate neighborhood. The topics they address may encourage people to note how many times a day they cross a bridge over water or the relationship to water of the earliest inhabitants or the use a particular industry made of water or a neighborhoods’ local issues with water availability or history of flooding or the city’s latest green infrastructure project or even the future use of the waterfront. These projects will be implemented and overseen by the MKE / City as Living Laboratory. Incrementally, over a period of time, the city becomes legible in terms of water. The overall objective will be to increase water IQ of citizens throughout the city through place based experience (rather than the abstract experience of reading a book). By recognizing their own roles as ‘vessels’ in their own communities people can begin to appreciate and acknowledge their responsibility for water as a resource that is both vital to life as well as to the general well-being across the region. This blog is part of the 2016 Summit Blog Series. Mary spoke at the New Cities Summit on 21-23 June in Montréal, Canada. Mary Miss has reshaped the boundaries between sculpture, architecture, landscape design, and installation art by articulating a vision of the public sphere where it is possible for an artist to address the issues of our time. She has developed the “City as Living Lab”, a framework for making issues of sustainability tangible through collaboration and the arts.